I love Russian Imperial Stouts. I’m not a beer collector or trader, but I’ll go out of my way for a good RIS. I horde Yeti and Expedition. My first homebrewed Russian Imperial Stout, the Black Loch, was the first beer I’d ever call “mine”, and it’s the first beer I ever won an award with. As a drinker and brewer, Imperial Stouts just have a special place in my heart. Lately, my stouts haven’t been coming out too well. The roast character is either harsh or withdrawn, the alcohol character isn’t present, fermentation is sub-par. Not a great place to be, and I’ve blamed a lot of these issues on a lot of different causes. Maybe my roasted malt isn’t from the right maltster, maybe I’m not pitching healthy enough yeast, maybe my water profile is off. A lot of issues. I didn’t have this problem originally, and looking back, thinking “what changed?”, the only thing that I can point to is me. As a brewer, I’ve changed. I formulate recipes differently, I take less risks, I’ve gone down the rabbit hole of “this is what will work” without identifying any of that theory in practice. I’m interested in practice. This series will be all about building my next Russian Imperial Stout for the 2017 NHC. Tentative name for this dark monster is Behemoth.The point of this series is to look into how brewers (professionals and hobbyists) are making their Russian Imperial Stouts, what parts of the process they are making a point of doing well, and how I can implement those practices to brew a better RIS. In preparation for this series, I decided to contact the /r/homebrewing community and see how they were making their imperial stouts. Particularly, I wanted to see how common certain trends were, and if there was anything I could pull from the data that would validate some of the other information I’ve gathered. 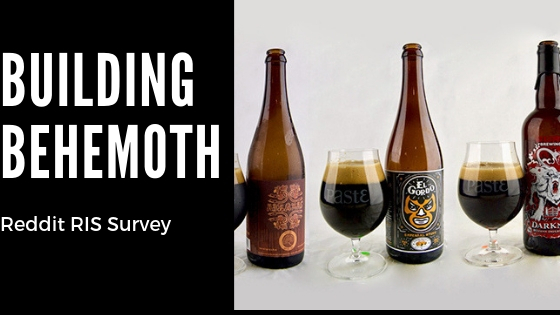 Note: This survey is just a survey, it isn’t saying anything definitive about imperial stouts, it’s not scientific, it isn’t meant to “do” anything or make a specific argument.More than anything else, I think this data is interesting. I would not recommend making a decision for your next brew based off of this data, because everything is tied to the individual recipe. If your yeast is REALLY attenuative, you may need to make an effort to set up some unfermentable sugars. If you want some esters in your beer, an English yeast may be the way to go. 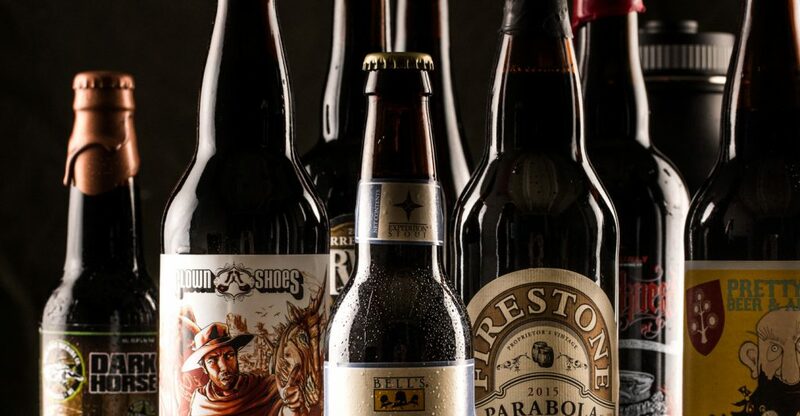 All beers are different, and the individual beer will call for its own ingredients and process. Personally I used this data as a guideline, looking at variables I’d like to try, taking notes from batch to batch, and really dialing in the recipe. As part of the survey conducted on /r/homebrewing, I was interested in the mash temps brewers are using for their RIS. The common knowledge says that a lower temperature will give you a more fermentable wort, leaving behind less body and sweetness, while a higher temperature will do the opposite, creating unfermentable sugars which contribute to body and sweetness. It’s always interesting to me how most people gravitate towards even numbers. So the absolute average out of 97 responses here is 153.8°F, so around 154°F. Others note a blend between MO and 2-row, or a blend of MO and Munich, or even just using Golden Promise as the base malt. Far and above, we see people answering that they use 2-row. This is a self-select survey, people opt in to take it, so I wouldn’t by any means claim it represents the homebrewing community as a whole, but it’s definitely an interesting point of data. Until now, I’ve only used MO in my Stouts, but after the overwhelming response from the community (and fantastic notes from Tim Matthews I’ll discuss in a later part of the series), I’m on board, at least enough to add it to the list of experiments. When I was critiquing my own RIS, one of the first reasons I jumped to for not having the roast quality I wanted was the brand of roasted malt (Briess) I was using. It made sense to me that an inferior malt would produce an inferior product, and that’s not to say that Briess is default inferior, but that it wasn’t the malt for me and my RIS. After reading a response from Tim Matthews who said that they (Oskar Blues) use all Simpsons roasted malts, I was even further convinced that the malt was the issue. Now I’m not so sure, but I do think the question of malt variety is interesting, and wanted to see if other brewers paid attention to it in a malt forward beer like a RIS. Some of the “Other” responses were stating the blend they use, or that they toasted their own. Also, one vote for Bairds malts and two votes for Crisp, which weren’t represented on the survey. I found it really interesting that most brewers either didn’t pay attention to the malt they were using, or used a blend of roasted grains. I should have gone further and asked more about the grains, /u/TestingApril of the blog In Bounds Brewing suggested having a checklist option for all of the brands and their malts, which I definitely should have done. If this survey is ever re-done, that’ll need to be implemented. I’m still convinced that maltster plays a role in the final beer, but it’s worth testing. That may be the next experiment, whether Briess Roasted Grains and Simpsons can be distinguished in a RIS. For now I’m thinking yes, and I’ll be using Simpsons. I should have asked when the additions were as well, my guess of “bittering and aroma” probably doesn’t hold true for all, or even most, of the recipes here. What is interesting is the massive margin that 2 hop additions wins by. Personally, I use 2 additions now and I don’t see a reason to change it. A bittering addition and then a 10 minute addition works well. Hops, in my opinion, just shouldn’t stand out in an Imperial Stout. I’ve had some “hopped up” stouts like Pipeworks Brewing’s Close Encounter, and they can be good, it is just not what I’m looking for in an Imperial Stout. More than anything, I’m paying more attention to the research portion of this article, listed above. My plan is to stick to two hop additions, maintain a good IBU/OG ratio, and experiment with high versus low alpha acid hops. As someone who collects yeast like some people collect stamps, I found these results incredibly interesting. A vast majority of survey participants selected US-05 as their go to RIS yeast. Those who opted to give a reason said it was because it was a clean-fermenting yeast, readily available, and it’s easy to make sure you are pitching enough cells. Most participants who noted more than just their yeast selection made a point to note they used their yeast because it was either clean or had a good ester profile, a pretty clear line between an English or American selection. Personally I really enjoy Scottish Ale Yeast, WYeast 1728. It’s attenuative, versatile, and it has a romantic place in my heart as the yeast I used in my first beer that won an award. That said, I’m heavily biased towards the yeast and the idea of not using it makes me a little uncomfortable. Pretty clear sign that it’s something I need to experiment with and take a step back to reevaluate. Like the other results though, yeasts are tied to their recipe. There isn’t a good way to “test” yeasts against each other because they may excel in different worts, as different beers. All about personal preference. I will say, from the professional list above, I tend to enjoy the beers made with Chico than yeasts made with English strains. I’m going to need to look into it, but in the re-design of the beer I’m going to experiment with a yeast like US-05 or WLP090. Part of refining your tastes is letting go of ideas you’ve held in brewing in favor of a subjectively better beer. The dogma of “Imperial Stouts improve over time” comes up pretty often in the research I’ve been doing, and I’m curious to see who intentionally ages as a part of their process. Out of 100 responses, 83 people said that they intentionally age their RIS, and the average intentional aging time was 3 months. Most people aged at least one month, what really threw the average was the few people who intentionally make a yearly batch, and age for said year. By far, the second bullet. Easily the most common answer. I loved doing this survey, it was awesome to see how some homebrewers are treating recipe construction and what they consider important for the style. If nothing else, this survey will be used throughout the series to either reinforce the other data, or to show how “rules” may not always be the case in practice. Next time, I’m going to look into grain bills from professional brewers and past NHC winners to see how they are building the grain bills of their stouts.